Vision loss can affect dogs in the same way that it affects humans. As your canine companion ages, they can start to go blind. Some even lose vision in one eye while retaining their abilities in the other. 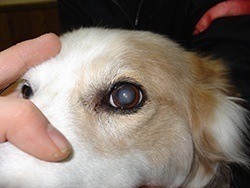 it's most common in older dogs and those that are genetically predisposed to ocular issues. It can be difficult to determine if your pup's vision is starting to deteriorate. Dogs can be masters of deception. They'll do all that they can to get by and make sure that you don't know that they're suffering. They'll use their other senses to make up for their lack of vision. In many cases, owners won't even realize that their poor puppy is having vision issues until up to 80% of their abilities are gone. With all that being said, there are ways that you can check your dog's vision at home. These tests are simple enough and will let you know if you need to take your furry friend to the veterinarian. Before you start testing for poor ocular health, you should have a general idea of how your dog sees the world normally. It's important to use this test early on in your dog's life so that you can use the information you gather as a comparison with tests in the future. It should be noted that this test is by no means scientific and should never replace professional alternatives. Instead, it's meant to give you a general idea of how well your pup can see. First, have another person hold your dog in place. While that's being done, gather one of your dog's favorite toys. Avoid any brightly colored options, as these are typically easier to see than normal ones. Start off at a distance and slowly walk towards your dog until they notice the toy and get excited. This distance can be used as a baseline. You can perform this test regularly throughout your dog's life so that you always know how their vision is degenerating. In some cases, you may be able to see physical signs of vision impairment. These symptoms indicate an underlying cause that may be treatable, so it's important that you contact a vet as soon as you notice these changes. One of the most common issues is fuzziness on the eye. Small cloudy spots can form on the surface of the eyeball and impair your dog's vision. These are a result of Glaucoma. Glaucoma is a disease that affects the optic nerve. Increased pressure in the eye prevents fluid from escaping, resulting in the cloudiness. Even small opaque spots can spread and render your dog blind. Smaller spots are easier to manage for dogs. They can use the other eye or see around the spot. A dog's eyes will dilate and constrict like yours do. Healthy pupils will open up in darker environments and constrict in brighter ones. This process helps to regulate how much light is getting into the back of the eye. To perform this test, have your dog down and grab a standard small flashlight. 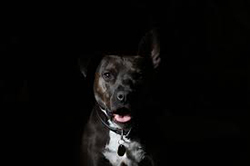 Avoid using high-powered lights that could hurt your dog. Then, simply shine the light over the eyes. You should notice that the pupils constrict when they're exposed to light. If they stay dilated even when the light is directly over them, your dog may already be blind. A lack of dilation indicates that the light isn't able to to the back of the eye. Take your pup to the vet for a proper diagnosis. One of the reasons why so many pet owners fail to realize that their dog is losing his or her vision is because they don't have problems getting around the house. When they're not bumping into furniture every few minutes they must be able to see, right? In reality, dogs probably have the layout of your home memorized. They know exactly where each couch or side table is. One easy way to see if your dog is slowly going blind is to rearrange some furniture and set up an obstacle course. It's best to do this at night because night vision is often the first to go. If you were to perform it during the day, your pup may use what remaining vision they have to complete it. Once you've moved furniture in places your dog would not expect it to be, place them on one end of the room and call out to them. It's important that you call out only once. They'll use the constant sound of your voice to get through if you call repeatedly. If your dog bumps into furniture, they are suffering from vision impairment. Also known as the Menace Response Test, this method can help you determine how your dog responds to objects coming close. Dogs will instinctively blink their eyes as an obstacle approaches. However, if they can't see, this won't happen. Place your dog in a room that has normal lighting. Then, use one hand to cover one eye. It's important to test one eye at a time to ensure that you can get accurate results. Bring your other hand close to their opened eye slowly. You should be coming from the corner of the eye so that your hand comes into their vision. Make sure to do this part slowly. If you move to fast, you may create a small push of air that alerts them. Also, avoid touching their whiskers. Your dog should start blinking. If not, take them to a vet. This test is very similar to the previous one. However, it tests your dog's ability to follow moving objects with their eyes. Start by covering up a single eye. Now take a small cotton ball and drop it approximately 6 inches from their eyes. Drop it from a height above their head where they can't see it. Once the ball drops, your dog's eyes should follow its motions. They may even try to eat it or give it a good sniff when it comes down. These are all good signs. If your dog doesn't respond at all, they are suffering from ocular problems. You can perform this test at varying distances to test how well your dog can see. It's important that you always use a dry cotton ball. Cotton balls don't make any sound when they hit the floor, so there's no way that your dog can use his or her other senses to find it. If your dog fails any of these tests, a trip to the vet is crucial. They'll be able to perform a routine eye examination to get a better understanding of what issues they're facing. They may also refer you to an animal ophthalmologist. An ophthalmologist is better-equipped to perform an in-depth analysis of your dog's overall ocular health. While going blind may be common in dogs, there are things that you can do to protect your dog's vision. Depending on your dog's particular needs, your veterinarian may create a treatment plan. This plan can include a high-quality diet, medication, or even surgery. You can use these tests to catch the problem early on. You'll have a better chance of saving your dog's vision the earlier you can get them the care that they need. Also Read: Is my Dog Dying?